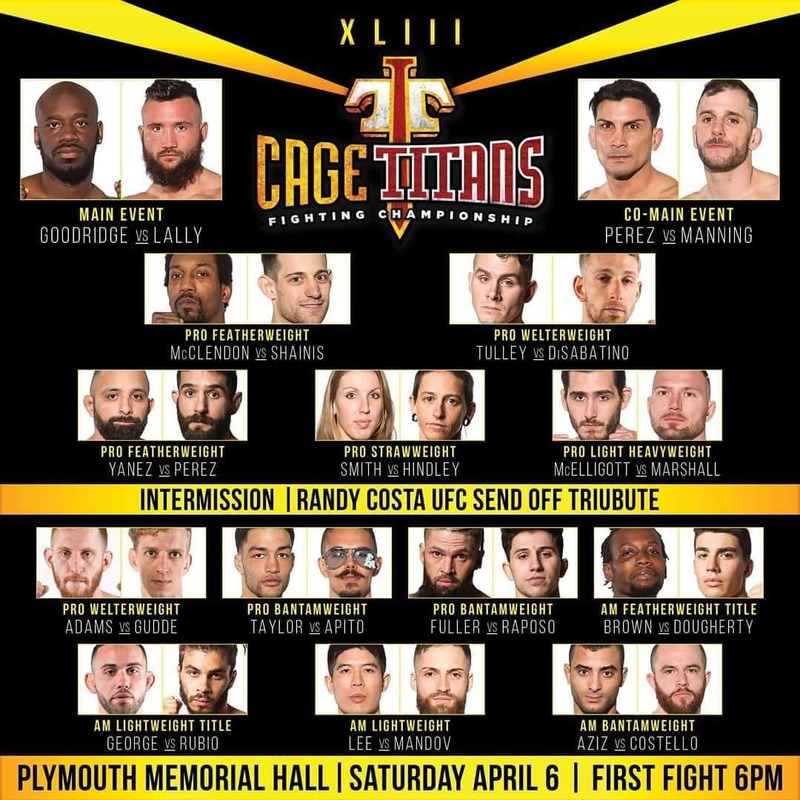 Plymouth, Massachusetts - We arrived just before doors opened, we grabbed our seats cage side as we anxiously await the commencement of Cage Titans 43! Rumors are swirling around Plymouth Memorial Hall that the DiSabatino .v Tulley fight has been scrapped....we are due to be underway at 6:20 PM local time. Last fight: Second round Submission (Rear Naked Choke) loss to Jose Lugo at CES 50: Paiva v. Ewell. Last fight: Unanimous decision victory over Will Smith at Cage Titans 38. Round 1: Taylor lands a nasty leg kick to start the action and they are trading kick as both these men look to strike early and often. Taylor drops Apito but Jocobo gets back up and puts pressure on Taylor these is all out action. Taylor clinches Jocobo on the cage and get in some dirty boxing. They seperate and Apito lands a tight headkick that stuns Taylor but he keeps his feet and they keep banging. Taylor strikes the cup of Apito and we have a brief stop in action. Jocobo starts up with a body kick that gets the clinch from Taylor they seperate and Jocobo changes levels nicely for a double leg and works from top control. Jocobo finishes the round on top landing hammerfists and elbows as Taylor is saved by the bell. 10-9 Jocobo. Round 2: One minute was not enough time to catch my breathe. Jocobo comes out throwing leg kicks and Taylor lands an uppercut. Taylor comes forward with two left hands Jocobo sets up for a kick and is met by the clinch f Taylor, Jocobo tuns the action and has Taylor on the cage. They break and Apito lands another double leg and is working the top control once again. Jocobo gets side control on the cage and is landing hammerfists. Taylor gets up but is greeted by knees to the face by Jocobo. They return to striking distance briefly and Jocobo lands a double leg and mounts Taylor a and lands some heavy ground and pound before transitioning to a Rear Naked Choke attempt that Taylor defends. Jocobo returns to mount and drops more heavy leather to the face of Taylor for the stoppage. Decision: Jocobo Apito defeats Michael Taylor by TKO (Ground and Pound) at 4:58 of the second round! WHAT A WAR! Round 2: Aziz starts the round with two leg kicks followed by a double leg takedown but ends up in a guillotine attempt but he fights off the attempt. Costello gives his back to get to his feet but never makes it to the feet before Aziz locks in a head and arm choke against the fence. Aziz gets seperation from the cage but Costello escapes but is taken back down by Aziz. Costello goes for broke on a kneebar but Aziz defends and has Costello's back as the round ends. 10-9 Aziz. Round 3: Aziz comes out with leg kicks followed by a combination upstairs and Costello looks tired. Aziz is tearing Costello apart on the feet landing multiple unanswered strikes to the head and body of Costello for the referee stoppage. Decision: Ebrahim Aziz defeats Seaon Costello by TKO (Unanswered Strikes) at 1:00 of the third round. Round 1: Mandov comes out with leg kicks and front kicks followed by a high kick that just misses. Mandov lands a huge trip but it is Lee that ends up on top as Mandov works to get back to his feet. They return to striking distance as Mandov looks to show some more finess on the feet here. But Mike wastes little time taking Mandov down and working from top control. Lee Works punches to the body as the round expires. Close round 10-9 Lee. Round 2: Fighters exchange jabs to open the round as Jam first off a shot and Lee goes for the takedown and with a little work Lee lands that takedown and works for the back of Mandov. Lee gets the back and gets both hooks in and is looking to isolate the neck of Mandov. Mandov attempts to roll out but Lee stays on the back and continues to work for the Rear Naked Choke. Mike's forearm finally finds the neck of Mandov causing him to tap instantly. Decision: Mike Lee defeats Jam Mandov by Submission (Rear Naked Choke) at 2:33 of round 2. Last fight: First round Knockout of Matt Biena at Reality Fighting: New Years Bash 3. Last fight: First round submission (Guillotine) of James Squires at Cage Titans 41. Round 1: They comes out trading jabs and leg kicks and Eddy catches a kick and puts Rubio on the cage and lands some huge punches that crumble Dion. Rubio recovers however and puts George on the cage and starts to go to work himself. They breaks and Rubio is bleeding from the nose as George lands some more hands to his chin. George drops Rubio with a right hand and hops on top looking for more damage. George looks to pass the guard of Rubio but ends up on the back of Rubio as the round ends. 10-9 George...could be 10-8 with the knockdowns. Round 2: George fires the first combination of the round but Rubio follows with a combination of his own. George lands a high kick that is partially blocked and Rubio comes forward as these guys are swinging for the fences and George is now landing at will and doing heavy damage to the undefeated Rubio as George clinches Rubio on the cage. They return to striking distance as Rubio connects with an uppercut that hurts George and George gets in a throw. Rubio returns to his feet and continues to fire heavy shots as George clinches to avoid further damage. 10-9 Rubio but really close. Round 3: Fighters are clearly tired as the round gets underway but Rubio wakes up and lands some hands before Eddy catches a kick and dumps him to the mat. Rubio gets to his feet and gets the back of George and lands some huge knees on the cage to the midsection of George before George can escape. George fire a headkick that is answered by an overhand right by Rubio and George changes levels for the takedown against the cage. George ends up in side control as the third round ends. 10-9 George. Another close one. Round 4: Both men lands jabs as the round starts as George looks to clinch but its Rubio who puts George on the fence. Fighters exchange combinations once again and Rubio puts George on the cage and goes to work with short knees to the body. Rubio comes up short on a single leg but lands a right hand on the break. George shoots in deep on a double leg and takes Rubio down on the cage wall. 10-9 George but it is close once again. Round 5: Dion opens the final round with a right hand and George shoots for a takedown as Rubio looks for a guillotine. George breaks the guillotine hold but Rubio gets him to the mat briefly and they return to striking distance. Rubio shoots in for a huge double leg against the cage wall but like a zombie George returns to his feet. Dion comes forward with jabs and George returns with a left hand. Dion swings the right and Eddy changes levels for the takedown with just 15 seconds left to work. George ends the fight on top landing hammerfists. Such a close fight this one is going to be tough to call. 10-9 Rubio. Decision: Eddy George defeats Dion Rubio by Unanimous Decision (49-46, 48-46, 50-45) to become the New Cage Titans Amateur Lightweight Champion! Great Fight! Last fight: Unanimous decision victory over Chaz Fowler at 864 Fighting Championship. Last fight: Unanimous decision victory over Sean Murrin at Cage Titans 41. Round 1: Brown comes out like a house on fire but Shane gets in the first solid strike of the fight with a body kick. Shane then goes to work on the lead leg of Brown and then follows with back to back headkicks that are partially blocked. Brown grabs the next kick from Dougherty and dumps him but lets him right back up. Brown catches another kick from Dougherty and takes Dougherty to the ground where Shane locks in a Triangle, Brown looks to escape but ends up on the bottom still in the triangle and getting battered with hammerfists from Shane as Bryan Miner steps in and saves Brown from further damage. Decision: Shane Dougherty defeats Jordan Brown by TKO (Ground and Pound) at 2:22 of the first round to capture the Cage Titans Amateur Featherweight Title! Last fight: First round Submission (Rear Naked Choke) loss to Kenny Murphy at Combat Zone 69. Last fight: Unanimous decision victory over David Michael Durao at AMMO Fight League 5. Round 1: Mitch comes out and gets thed takedown early and works to side control and works to a crucifix position and lands some sharp elbows as Fuller looks to control the head of Raposo. Mitch looks for the Americana and Rob defends but Mitch locks in a tight Head and Arm choke that gets Fuller to tap. Decision: Mitch Rapose defeats Rob Fuller by Submission (Head and Arm Choke) at 1:37 of round number 1. Last fight: First round Knockout loss to Zach DiSabatino at Cage Titans 40. Last fight: First round Submission (Rear Naked Choke) of Neil Von Flatern at Cage Titans 40. Round 1: Trevor comes out and backs Adams down and lands a right hand and they go to ground Adams sinks in a deep triangle and Gudde is in trouble. Gudde struggles to defend but this choke is deep and Trevor goes to sleep. Decision: Johnny Adams defeats Trevor Gudde by Submission (Triangle Choke) at 55 seconds of the first round. Last fight: Unanimous decision victory over Ray Shawdee at Combat Zone 68. Last fight: Second round Submissions (Rear Naked Choke) loss to Fabio Cherant at CES 53: Gravely v. Nordby. Round 1: Jesse comes out backing Ron down with jabs and Ron clinches and lands a knee to the forehead of Jesse as they clinch on the cage. Jesse goes deep on a double leg and eats shots to the body from Ron for his efforts. Jesse continues to work however and finally lands the takedown and has Ron against the cage as he works from the top. Jesse tries to posture up to no avail but lands some short shots as Marshall still looks to get to his feet. Jesse moves to side control and lands a couple more punches as Ron looks to fire some leather from the bottom. With seconds left Ron gets to his feet and lands some hammerfists to the side of Jesse's face. 10-9 McElligott. Round 2: The cage side doctor is taking a look at a cut about the left eye of Marshall between rounds. Ron comes out firing right hands as Jesse clinches and gets another takedown as he looks to spend another round on top of Ron Marshall. Jesse is in side control working a Kimura on Ron's left arm but Ron escapes the armlock and gets back to his feet but is pressed on the cage by Jesse. Jesse once again lands a throw and is looking for a crucifix on Marshall trapping his right arm and working short elbows to the ribs. Marshall escapes and lands some heavy leather then pulls guard on a guillotine attempt that is slipping away. Jesse scrambles to the back and Ron slams to the cage and Jesse sinks a Head and Arm choke for the tap. 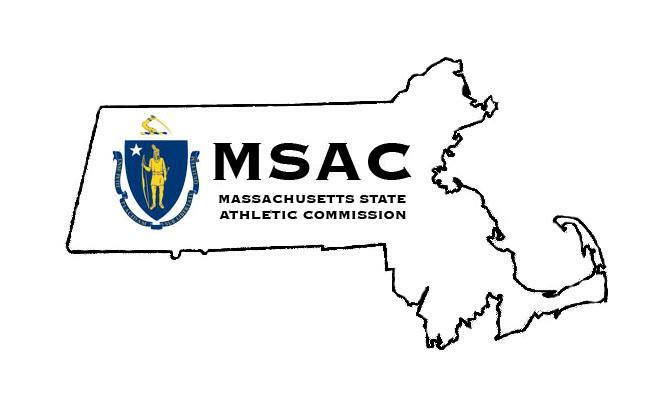 Decision: Jesse McElligott defeats Ron Marshall by Submission (Arm Triangle Choke) at 4:37 of the Second round. Last fight: Second round Submission (Armbar) loss to Mandy Polk at Attitude MMA Fights 16. Last fight: First round Submission (Rear Naked Choke) loss to Alyssa Krahn at Cage Titans 41. Last fight: First round Knockout (Body Punch) loss to Marquis Brewster at CES 46: Howard v. Carroll. Last fight: Unanimous decision loss to Shane Manley at Cage Titans 42. Round 1: Yanez comes out throwing the jab looking to keep Perez at distance and avoid his grappling. Perez gets in some strikes of his own including a loud lower leg kick but Yanez answers with a kick to body and Perez uncorks an overhand right that starches Yanez as Perez lands the walkoff knockout! Wow! Decision: Jeff Perez defeats Raymond Yanez by Knockout at 1:30 of round number one! Last fight: Second round Knockout loss to Marty Navis at Cage Titans 42. Last fight: Split Decision loss to Darius Estell at Cage Titans 42. Bout Scrapped due to findings in Albert Tulleys MRI results. Cage Titans announces that Arthur M'Pofu will defend his Amateur Bantamweight Title in June at Cage Titans 44 against Jeff Joy from Juniko. Last fight: First round Submission (Rear Naked Choke) loss to Jimmy Manning at Cage Titans 32. Last fight: Unanimous decision loss to Daniel Matos at Cage Titans 38. Round 1: Shainis comes across the cage clinches and lands a huge knee to the nose of McClendon that crumples McClendon to the mat and gets the stop from Bryan Miner. Decision: Don Shainis defeats David McClendon by Knockout (Flying Knee) at 10 seconds of the first round. Last fight: Second round Technical Submission (Injury) loss to Jimmy Manning at Cage Titans 35. Last fight: First round Knockout loss to Dan Dubuque at Cage Titans 38. Round 1: Fernando comes out and throws a kick early that is blocked by Manning, they scramble and Manning gets top position and stacks Perez against the cage. Jimmy gets in some strikes before taking the back of Perez and sinking in a Rear Naked Choke for the Tap. Decision: Jimmy Manning defeats Fernando Perez by Submission (Rear Naked Choke) at 1:25 of the first round! Last fight: Second round Knockout loss to John Heath at Maverick MMA 9. Last fight: Unanimous decision loss to Kemran Lachinov at Bellator 207. Round 1: Here we go! Goodridge starts with a low leg kick as these guys are showing a lot of respect for one another. Goodridge looks for a single leg but Lally stuffs the attempt briefly before accepting the spot on the ground. Goodridge is on top of Lally but Lally scrambles and Goodridge grabs a d'arce choke and Lally is fighting for his life but he escapes and is taken back down and it looks like Lally is hurt as he returns to his feel. Lally looks to have suffered some sort of damage to his right arm as it is dangling to his side and Bryan Miner calls in the doctor who stops the fight.